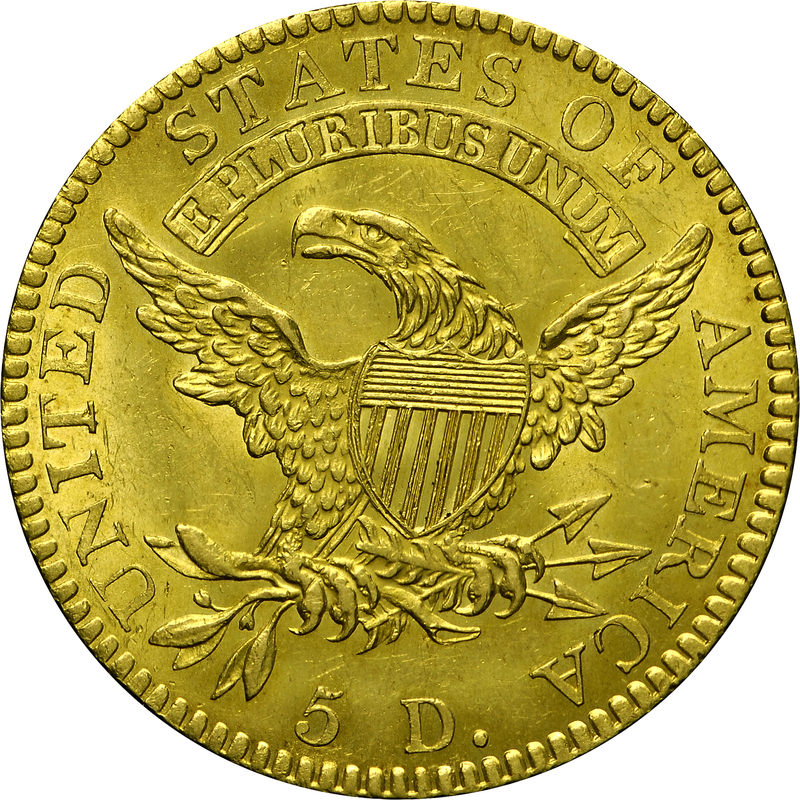 This 1820 half eagle belongs to the first group; however, it had a different obverse die than HBCC-3134 or 3135. The dentils at 1:00 are normally spaced and not merged. 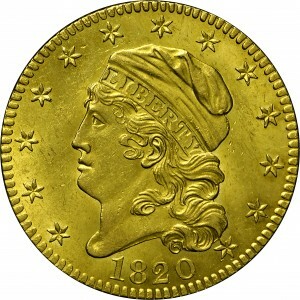 The lower right star clearly touches the hair curl, and the lower left star is distant from the bust. HBCC-3141, displayed below, is another example of Breen’s group, with the lower left star very nearly touching the bust. Using the notation in Walter Breen’s monograph, the varieties of his first group displayed from the Bass Collection include Breen 1-A (HBCC-3134), and HBCC-3141 which is a new variety. From Lester Merkin's sale of March 1969, Lot 194. Previously from Chapman's sale of the Wilson Collection, 1907, Lot 71. "Obverse: Flat-based 2. Symmetrical 8. Interior of 0 ovate. Star 1 is its own diameter away from bust (distinctive). Small curl over left side of 0. Star 13 has point firmly touching hair (distinctive); and has about half to left of an imaginary line drawn from back of cap to back of hair. Shows remnants of two points immediately below (distinctive). Small die center punch in front of ear. Reverse: Large letters. 'Punched' T (letter T has a triangular punch in bottom of upright. Used in other years.). S over P. T over I and space right. S over S and space right. Base of E clearly higher than that of adjacent T. M lacking most of right serif at base of left stand and all of left serif of right stand. Rear talon of right foot usually seen hanging below top leaves pair now but a weak, shallow field lump (distinctive). Adams 3."